On Election Day, Nov. 6, Emory will provide shuttle transportation for students, staff and faculty who are exercising one of the most foundational rights of citizenship in our democracy: the right to vote. When: Polling places are open 7 a.m. to 7 p.m. on Election Day, Tuesday, Nov. 6. The Emory Votes shuttle route will operate from 6:45 a.m. to 8 p.m.
Where: Emory Votes shuttle buses will transport voters from Woodruff Circle to the five polling locations below. In addition, four of the five locations are also served by Emory Cliff Shuttles regular routes. View more information on regular shuttle schedules. Druid Hills High School (1798 Haygood Dr., NE): Emory Votes shuttle. Also, Cliff routes 1525/VA, C, E and Loop. Every 5-10 minutes. Routes also serve Clairmont Campus. Emory Presbyterian Church (1886 N Decatur Road, NE): Emory Votes shuttle. Served also by the same Cliff shuttles serving nearby Druid Hills High and by CCTMA route at corner of N. Decatur and Haygood. Every 30 minutes. Briar Vista Elementary School (1131 Briar Vista Terrace, NE): Emory Votes shuttle. Served also by Cliff Executive Park route at the corner of Briarcliff and Briar Vista Terrace. Every 20 minutes during peak; 40 minutes off-peak. Clairmont Presbyterian Church (1994 Clairmont Road): Emory Votes shuttle only. No Emory Cliff service. North Decatur Presbyterian Church (611 Medlock Rd) (1886 N. Decatur Road). Emory Votes shuttle. Also served by Emory Cliff North DeKalb route at Medlock Road and N. Decatur (Melton’s App and Tap shopping center). Varies from 10 to 30 minutes. Track Emory Votes shuttles in real time via the TransLōc app or online. Confirm your status and polling place at Georgia Secretary of State website. If you are registered to vote in DeKalb County – regardless of the precinct in which you are registered – early voting is available from 7 a.m. to 7 p.m. until Friday, Nov. 2. A list of locations can be found here. Sponsored by the Office of the Provost, Emory Campus Life, Department of Political Science, SGA and Graduate SGA. On Election Day, Emory encourages students, staff and faculty to exercise one of the most foundational rights of citizenship in our democracy: the right to vote. Many Emory undergraduate students have recently reached voting age and will be casting a ballot for the first time this year. Others have voted in previous elections but consider this year’s midterms to be of special, even historic, significance. On Election Day, Tuesday, Nov. 6, the Emory Votes initiative will offer shuttle transportation for members of the university community who are registered to vote at any one of five designated polling places in the vicinity of Emory’s Druid Hills campus. Although Bittencourt lives off-campus and drives, she says she is likely to take a shuttle from campus for the convenience and for the camaraderie of sharing the experience with other Emory students. Polling places are open between 7 a.m. and 7 p.m. on Election Day. Shuttle buses displaying Emory Votes signage will operate on a continuous basis from 6:45 a.m. to 8 p.m. Voters may board shuttles at Woodruff Circle and return to that location. To vote at one of the polling places on the Emory Votes shuttle route on Election Day, a voter must be registered at that location, per state law. Voters may confirm their voting status and polling place on the Georgia Secretary of State website. Although the university is providing transportation on Election Day, voters are encouraged to vote early when possible. Reports compare early voter turnout this year to 2016, a banner year for voting nationwide, with turnout expected to also be very high on Election Day. A number of early voting locations are provided for DeKalb County voters on this website. Emory Votes follows a voter education and registration drive hosted at numerous campus venues from August through October, supported by multiple university organizations and individuals. The drive helped hundreds of students to register and provided information for many others. Like the registration drive, Emory Votes represents a broad partnership, according to David Clark, associate vice president of Campus Life. 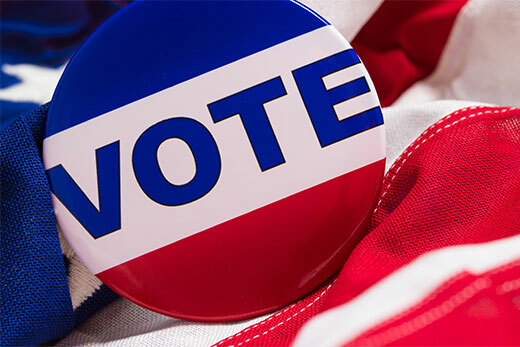 Emory’s commitment to encouraging students to vote, regardless of their political views, reflects the university’s tradition of nurturing students who become leaders in their professions and communities, as well as the nation and world, according to Alex Bolton, assistant professor of political science. “Voting is an important way for students to participate in the political process and can serve as a foundation for broader engagement here in the metro community and beyond,” says Bolton. Sydney Kaplan 19L, president of the Graduate Student Government Association (GSGA), agrees. The University Senate is also conducting “Get Out the Vote” efforts to encourage faculty, staff and students to vote. 1. Find your polling location. Use the Georgia Secretary of State’s My Voter Page to confirm you are registered, find early voting locations and find your polling place for Election Day. 2. Create your voting plan. If you are voting early in-person, try to take advantage of scheduled days off. If you requested a mail-in absentee ballot, mail it back as soon as possible, because ballots must be received by Election Day. Or plan to vote in-person on Nov. 6. 3. Vote! Remember to bring your government-issued photo ID. If your polling place is served by Emory Votes shuttles, decide if you are going to use this amenity or take other transportation to the polls. If you are an Emory employee, know that Emory’s Voting Policy allows requests for time off up to two hours to be considered if your work schedule would prevent you from voting. And if poll workers notify you of unexpected issues with your ability to vote, ask for a provisional ballot.